When youâre parked up on your holiday in your caravan or motorhome, the HDTV-compatible TracVision R4 brings you hundreds of channels of uninterrupted, crystal-clear digital satellite TV entertainment. This fully automatic stationary system also offers mobile reception of free-to-air as well as pay-TV services. The TracVision R4 automatically finds the satellite for you, and switches between signals giving you a perfect picture, the TracVision R4 offers tremendous versatility and value for people who want to enjoy they favourite programs when theyâre stopped for the evening. Plus, it is significantly more powerful than competing systems, bringing uninterrupted, crystal clear digital entertainment your vehicle. 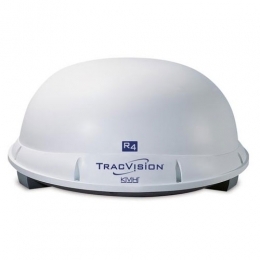 The TracVision R4 is easily one of the best stationary satellite products available today.